A few weeks ago, as I was preparing for my good friend's 50th birthday party, my Mom and I were chatting about the party plans. I mentioned that I had spent a few hours making three different kinds of cupcakes for dessert. "I don't know why you spent so much time on dessert," she said. "Nobody ever eats dessert." My Mom and I clearly travel in different social circles. 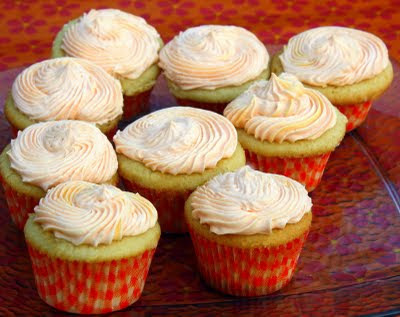 These Creamsicle cupcakes in particular were a hit. 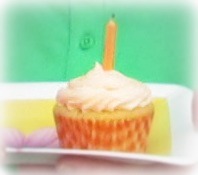 One guest took a cupcake home (with my blessing) and hid it from her husband. I got emails the day after the party asking for the recipe. So here it is -- my own creation. 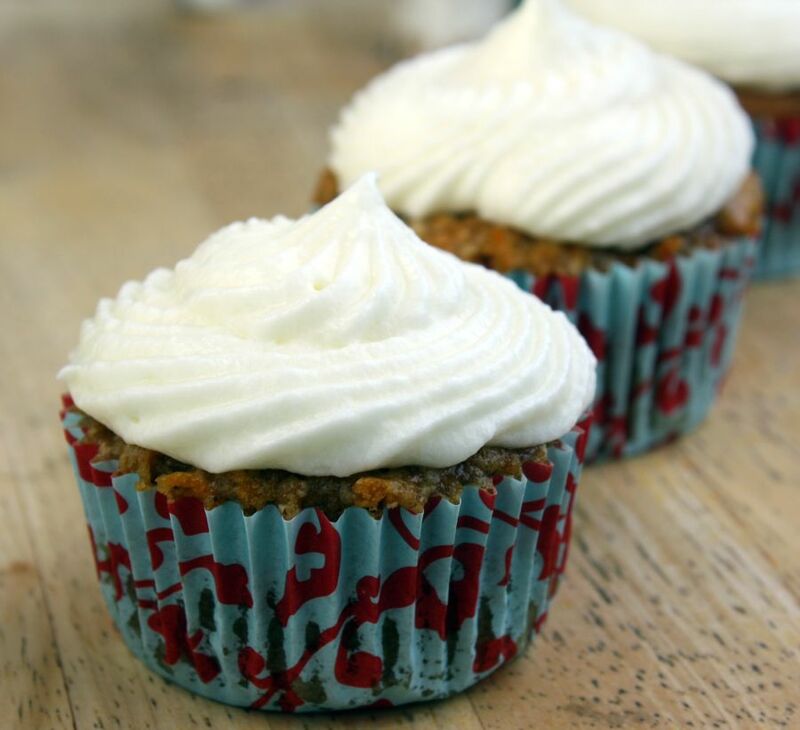 It's my favorite yellow cupcake recipe (from Cooks Illustrated), with a cream filling and orange icing. The orange icing is something I created by adding ingredients until I got a taste to my liking. I'm sure you could achieve a similar result with fewer ingredients, but that's what I did. And, for the record, I'll continue to spend time making desserts for get-togethers. Hey, if people don't eat them, at least I can enjoy the leftovers from my favorite part of the meal. In the bowl of your electric mixer, beat the flour, sugar, baking powder, and salt on low speed to combine. Add the butter, eggs, egg yolks, vanilla extract, and sour cream. Beat at medium speed until the batter is smooth and satiny, about 30 seconds. Scrape down the sides of the bowl. If necessary, stir the batter with a rubber spatula until the flour is fully incorporated. Evenly fill the muffin cups with the batter (I used the largest Pampered Chef scoop) and bake for about 20 - 25 minutes or until pale gold and a toothpick inserted into a cupcake comes out clean. Remove from oven and place on a wire rack to cool. 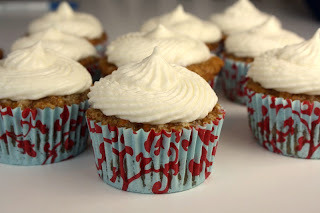 To assemble the Creamsicle cupcakes, I used the small end of a melon baller to scoop a hole in the cupcakes, then piped cream filling in the hole. Then I frosted with the orange frosting. Dissolve the salt in the hot water and allow to cool. Whip the marshmallow cream, shortening, powdered sugar, and vanilla until it begins to get fluffy. Add the salty water and whip well. You will have some filling left over after filling the cupcakes. It's great as a fruit dip or a dip for cinnamon graham cracker sticks. In the bowl of an electric mixer, beat the butter at medium-high speed until creamy. Add the rest of the ingredients and beat until combined. You may want to start with 2 teaspoons orange extract and then taste – add more if you think it needs it. Also add yellow and red food coloring until it’s the color you like. "WAIT! I forgot to take pictures of the cupcakes!" Everyone freezes as I snap a quick shot of my cupcakes. Welcome to a party thrown by a food blogger. 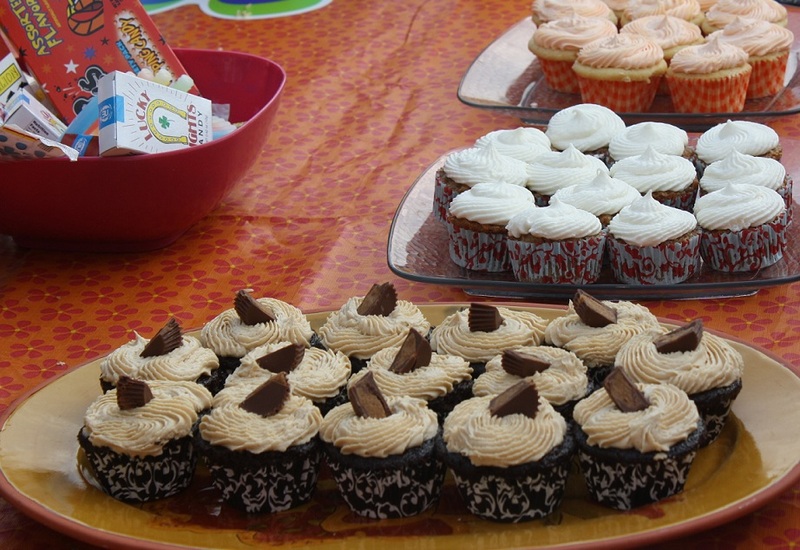 In the end, the picture above was the only picture I got of some of my cupcakes. Guess I won't be submitting this post to Tastespotting. So on to the Chocolate Peanut Butter cupcakes in the foreground. They were inspired by my recent visit to local cupcake shop, Sugar Mountain Bake Shoppe. 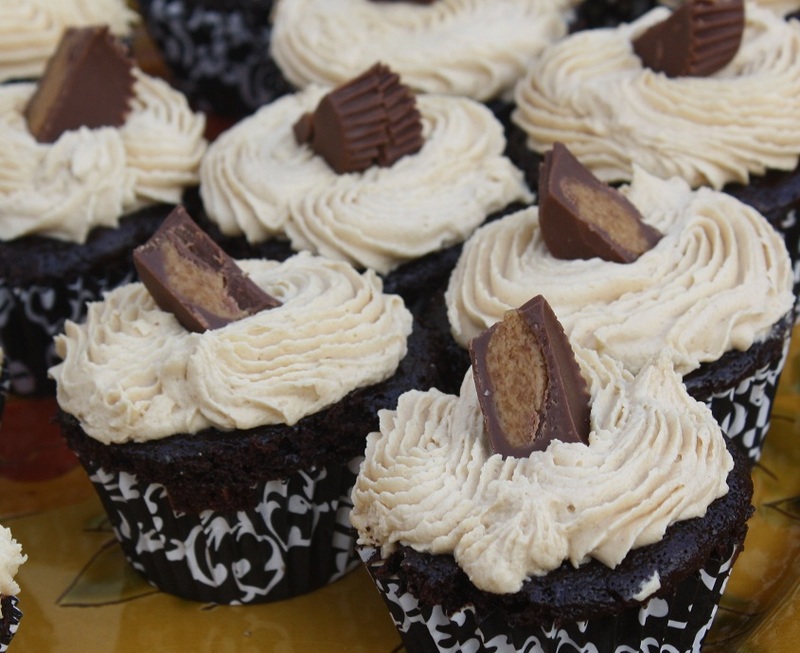 I loved the way their chocolate peanut butter cupcakes looked but thought the peanut butter frosting and filling overwhelmed the flavor of the chocolate cupcake. My version: my favorite chocolate cupcake recipe (which I got from the awesome Julie) topped with a generous amount of peanut butter buttercream. No filling. 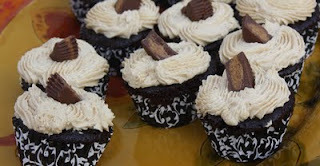 The peanut butter frosting, which was divine, still overwhelmed the chocolate flavor of the cupcake. I was surprised because those cupcakes were really chocolatey. Next time I may devise a chocolate filling to really bring out the chocolate flavor. All in all, the party goers were very happy with them. I even caught one person licking the wrapper. But the party favorite will come next. Mini peanut butter cups, cut in half. Preheat the oven to 350F degrees. Line cupcake cups with paper liners. Mix the hot coffee with the chopped chocolate, stirring occasionally until the mixture is smooth. In the bowl of an electric mixer fitted with the paddle attachment, beat the eggs until they are slightly thickened, about 3 minutes. Slowly add the canola oil, and mix at medium speed for 1 minute. Gradually add the sugar, mixing until well combined. Slowly add the buttermilk, coffee mixture and vanilla, and mix until blended. In a large bowl, sift together the flour, cocoa powder, baking soda, baking powder, and salt. Add the dry ingredients to the batter in three additions on low speed, stopping to scrape down the sides of the bowl as necessary. The batter will be liquidy. Divide the batter among the prepared pans and bake until a toothpick inserted into the center emerges clean, 18-22 minutes, until a toothpick inserted into the center emerges clean. When completely cooled, frost with peanut butter buttercream (for 36 cupcakes you'll need to multiply the recipe by 1 1/2). I used a Wilton 6B decorating tip to pipe on the frosting. Garnish with a half of a mini peanut butter cup. 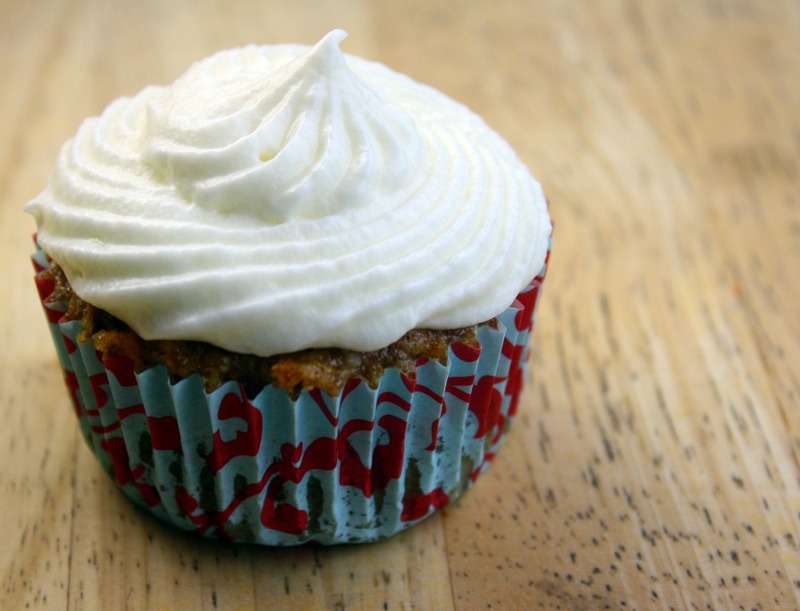 Beat butter and vanilla with an electric mixer until light and fluffy. Add peanut butter and mix until combined. Add powdered sugar in one cup increments. Add milk and beat until fluffy. Last weekend, I hosted a 50th birthday party for a close friend. Before the party, I asked her if she had any special requests (the party wasn't a surprise, which made it much less stressful for me). Her only request was cupcakes for dessert. Great! I love making cupcakes. I served three flavors, which I'll cover in three different blog posts. First up: Carrot Cupcakes with Cream Cheese Frosting. I originally found the recipe on a food blog, but then I spotted the same cupcake recipe in a past issue of Cooks Illustrated. I was missing one of the spices called for in the recipe, so I substituted pumpkin pie spice -- it contained all of the spices listed in the recipe. In the end, the cupcakes were good but nothing I'd swoon over. My guess is that Cooks Illustrated was going for a recipe that focused on the carrots, but I'd prefer more going on -- more spices and maybe some coconut and/or walnuts. The cream cheese frosting was my tried and true. Some details: I frosted the cupcakes using a Wilton 6B decorating tip and a large coupler. I got the cute cupcake liners from this online Esty shop. The liners were said to be greaseproof, but maybe 1 1/2 cups of oil was too much for even greaseproof liners. 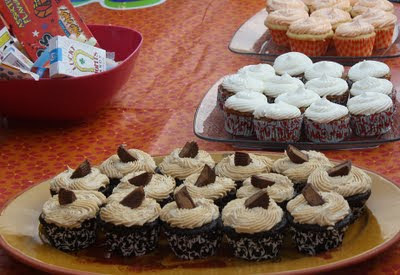 Next up will be the cupcakes that were the real hit of the party! Preheat oven to 350 degrees F. Line muffin pans with 24 baking cup liners. In a medium bowl, whisk together the flour, baking powder, baking soda, spices and salt; set aside. In a food processor fitted with a shredding disk, shred the carrots. Dump the carrots on top of the bowl with the dry ingredients and set aside. Wipe out the bowl of the food processor and fit with the metal blade. Process the sugars and eggs until frothy and combined, about 20 seconds. With the machine running, add the oil in a steady stream through the feed tube. Continue to process until the mixture is light in color and combined, about 20 more seconds. Transfer the mixture to a large mixing bowl and stir in the carrots and dry ingredients until incorporated and no streaks of flour remain. Divide the batter evenly among muffin pan cups. 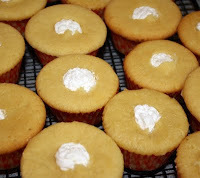 Bake 20 to 24 minutes or until toothpick inserted into center of cupcakes comes out clean. Cool cupcakes in muffin pan on wire rack for 5 minutes. Carefully lift each cupcake from muffin pan and set on wire rack. Cool to room temperature. Frost with cream cheese frosting, below. Blend together cream cheese and butter. With mixer on low speed, add the vanilla. Gradually add the powdered sugar until completely incorporated.